Check back often to learn about upcoming library programs and fundraising events. Join us for a fun introduction to the library with nursery rhymes, music, movement, repetition, instruments & books. We strive to develop the Whole child - literacy, language, motor coordination, social & emotional development. Please note that all scheduled storytimes are at a new time - 10:30am! Preschoolers will learn essential pre-reading skills and socialize with other children. Join us for a few stories and a whole lot of fun learning opportunities! The 4th Monday of of the Month is reserved for STEM Storytimes - new topic each month! Children must be accompanied by an adult. 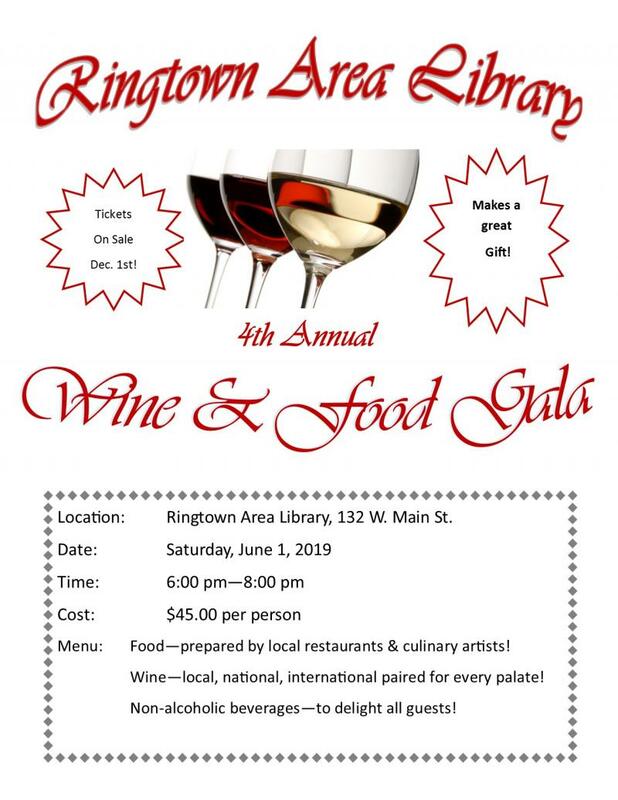 Please register in advance at the library or by calling (570) 889-5503. We are bringing these 2 popular children's programs to the Weekend! Come join us one Saturday each month for some fun stories, songs, nursery rhymes & more, with age-appropriate activities for each age group. Children must be accompanied by an adult for either program. Projects range from $10 to $25 depending on the surface you choose for your project. Select a Surface, select a transfer design, then apply chalk paste! Check out "Chalking Fun with Kathy" on FB to learn more! Plus Puzzles, audiobooks, DVD movies, and magazines all at Bargain Prices! 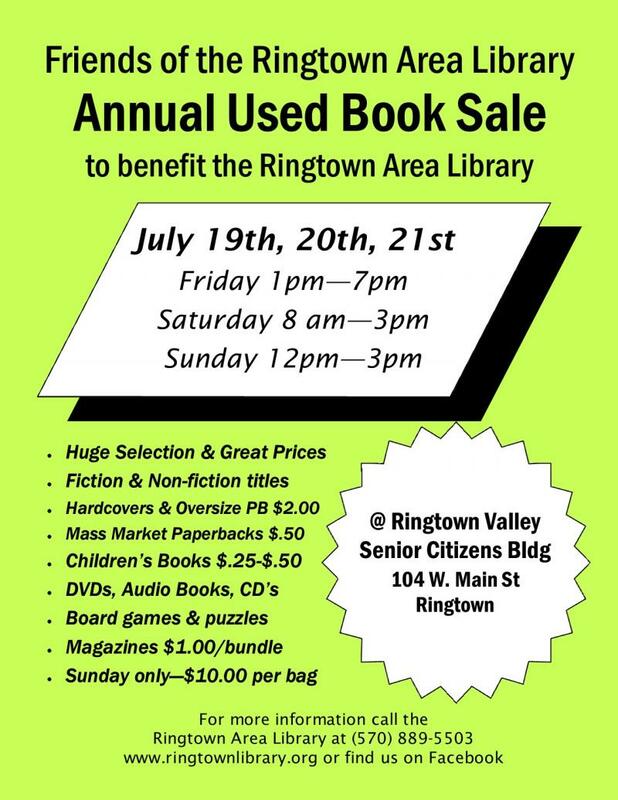 Donations for the 2019 Book Sale can now be dropped off at the Ringtown Area Library during regular library hours. 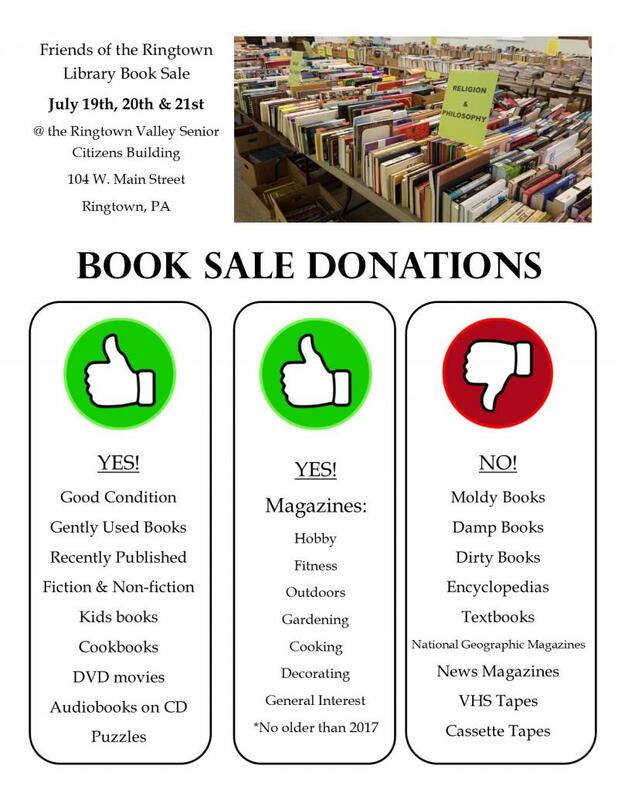 We respectfully ask that you only donate GOOD CONDITION, Gently used books, puzzles, DVD movies, audiobooks on CD, and the following magazines genres - hobby, outdoors, cooking, gardening, fitness and general interest NO MORE than 2 years old. Please NO moldy, damp, dirty or poor condition items as these are not sellable! Thank you for your cooperation in making our Book Sale a great success! 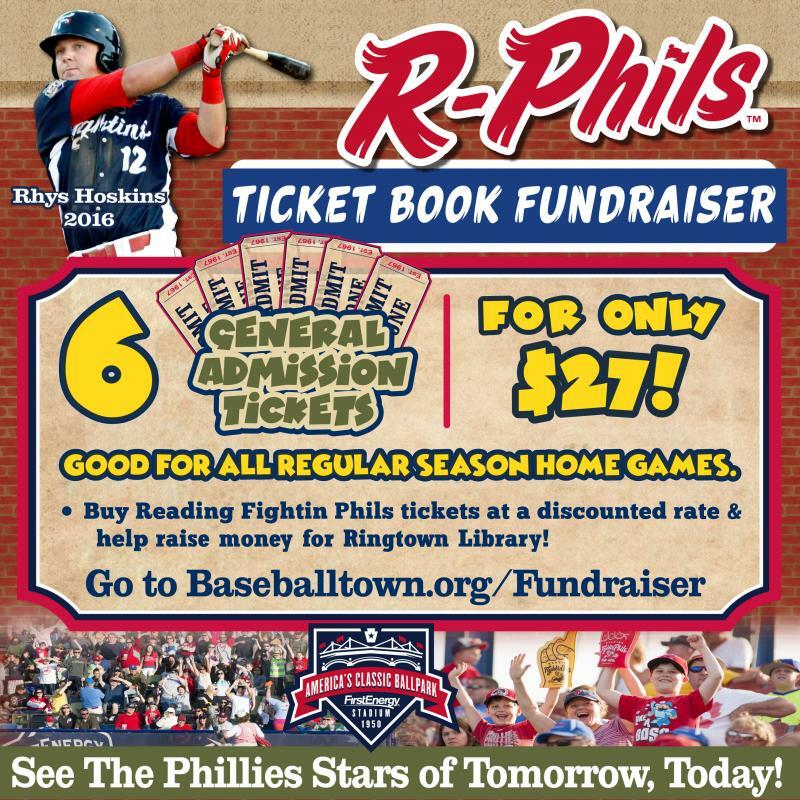 Purchase tickets for the 2019 Reading Fightin' Phils and support the Ringtown Area Library. 6 General Admission tickets cost just $27! Tickets can be purchased directly through this link, using PayPal for payment. 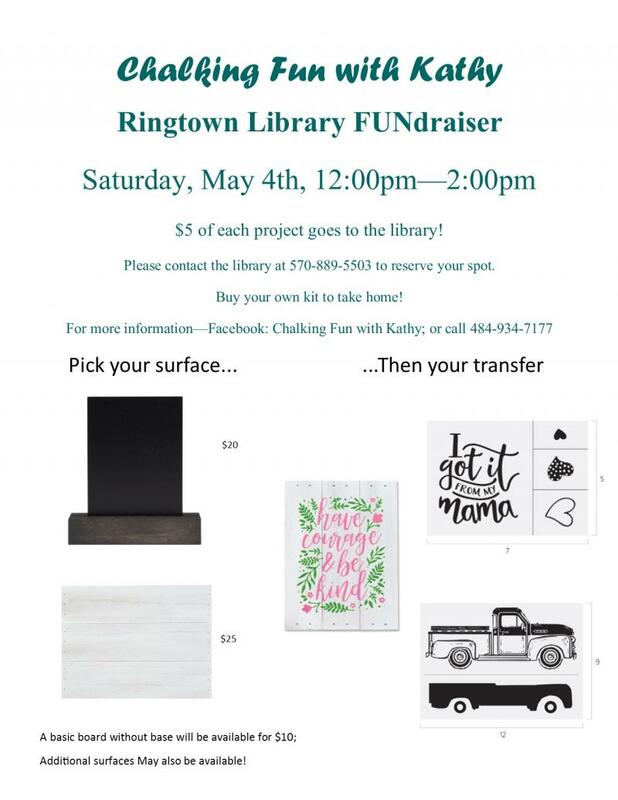 Enter "Ringtown Area Library" for the organization name and "Tanya Savitsky" for the name of seller. Your tickets will be mailed to you within approximately 7 days. 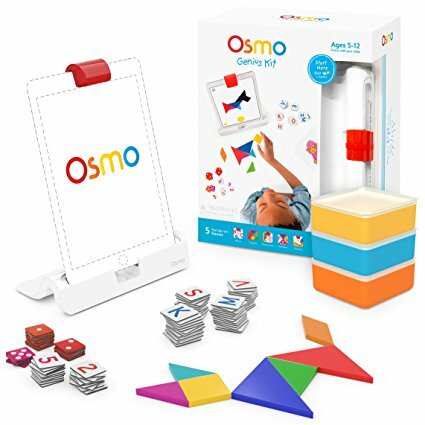 Osmo games for iPad now available! 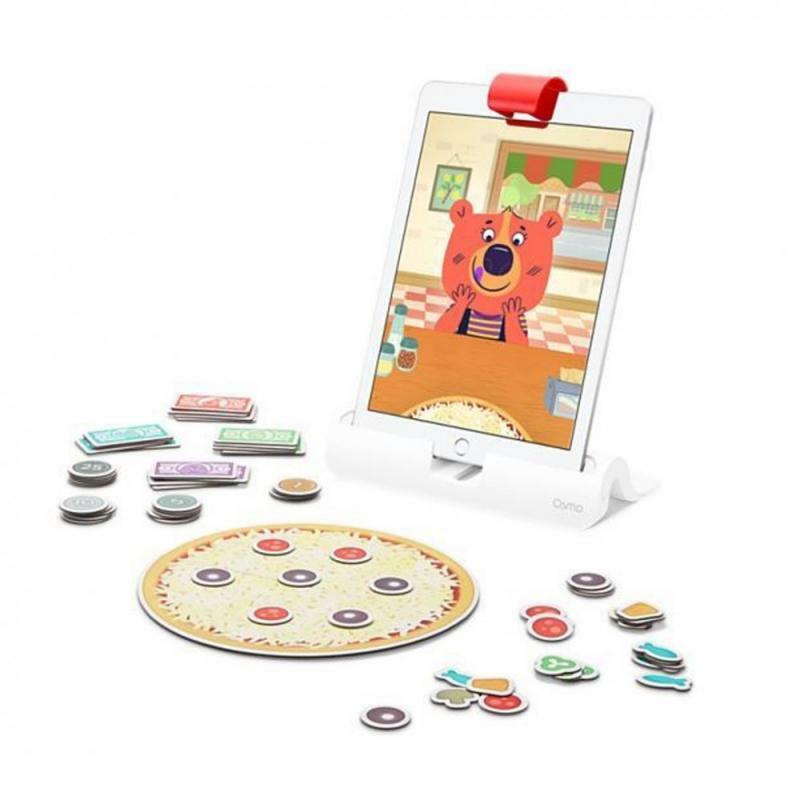 Osmo is an educational game system for iPad that connects physical play with the virtual world, made available to our library by a pilot project of the Office of Commonwealth Libraries. 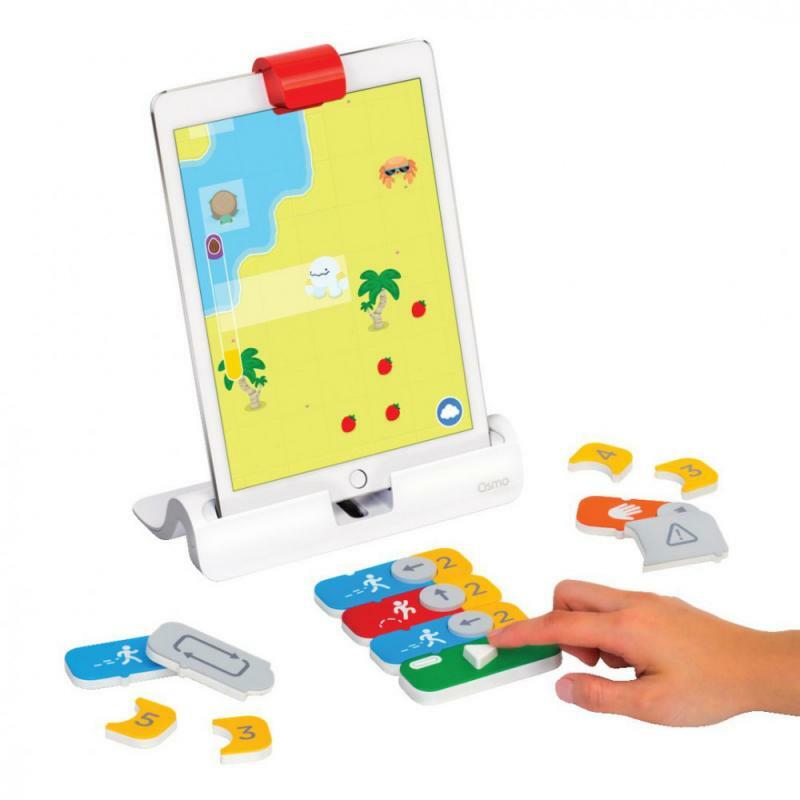 Coding Adventures with Awbie—Place coding blocks in front of an iPad in patterns and sequences and send Awbie on a magical & exciting adventure. Hot Wheels MindRacers—Players send real Hot Wheels cars racing down a ramp and into a variety of fun digital racetracks. Masterpiece—easy to follow outlines let kids become artists, then turn your drawings into a timelapse video. Monster—Kids’ drawings get pulled onto the screen and become part of magical animated activities. Newton—Use physical objects or hand-drawn lines & objects to guide falling on-screen balls into targeted zones. Numbers—arrange physical tiles including dots & digits to make numbers and complete simple arithmetic. Pizza Co.—Make pizzas with toppings and make change for your customers. Invest your profits to upgrade your pizza shop! Words—look at the on-screen clue, guess the secret word, then arrange letter tiles to spell the word. The library has an ongoing Candy Bar fundraiser. $1 each at the library circulation desk. Now Available for use in the library!